Cats, data from whom is posted here, were acquired from a certified commercial class B dealer. This means that they were either stray cats collected on streets by animal control agencies or animals surrended to shelters by owners, and for whom suitable adoptions were not available. Rather than to be euthanized, they were sold to a dealer, underwent health checks, and then were resold to research facilities. In IB laboratory, cats lived several years participating in different experiments and also contributing to training of students. One cat was in the lab for 15 years, never underwent any surgery but contributed to numerous biomechanical recordings and several publications. He passed away from old age. One other cat was in the lab for about 10 years, eventually was implanted with the head implant and contributed to 3 published studies before the implant was removed, and the cat fully rehabilitated and adopted out. Her photograph shortly before the adoption is featured on the cover of a journal that published one of the studies, to which this cat had contributed. Read about our cats and their contribution to science in the tabs below. Our work complied with all applicable regulations on the use of animals in research, and we did our very best to minimize discomfort of the cats we worked with. Read more on the use of animals in research here and here. 1) Quantification of motor cortex activity and full-body biomechanics during locomotion. Published. 2) Activity of motor cortex during scratching. Published. 1) Activity of motor cortex during walking on the flat surface and ladders with crosspieces of different width. Published. 2) Activity of motor cortex during walking on the flat surface under normal laboratory illumination and in complete darkness. Published. 3) Comparative study of the activity of pyramidal tract projecting neurons (PTNs) of the motor cortex with fast and slow conducting axons; walking on the flat surface and ladder with crosspieces 5 cm wide. Published. 4) Activity of neurons in the ventrolateral nucleus of the thalamus (VL) during walking on the flat surface and the ladder with crosspieces 5 cm wide. Published. 5) Activity of red nucleus during balance on platform tilting left-right. Published. A large grey male, 5 kg. 2) Stabilization of the paw during walking. Published. 3) Activity of neurons in the motor cortex during walking on the ladder when one on the crisspieces displaces at different time of cat approaching it. Published. 4) Activity of neurons in the motor compartment of the reticular nucleus of the thalamus (RE) during walking on the flat surface and the ladder with crosspieces 5 cm wide. Published-1, Published-2. A medium size black & white male, 4 kg. 2) Activity of pyramidal tract neurons of the motor cortex during standing and walking on an inclined plane. Published. 3) Activity of neurons in the motor cortex during walking on the ladder when one on the crosspieces displaces at different time of cat approaching it. Published. 4) Activity of red nucleus during balancing on a platform that tilts left-right. Published. 5) Stabilization of the paw during walking. Published. 1) Activity of motor cortex while walking with straddling a long obstacle. Published. 2) Activity of motor cortex while walking along a 5 cm narrow strip. Published. 3) Postural responses to lateral body pushes. Published. 4) Activity of red nucleus during balance on platform tilting left-right. Published. These are the notes taken during recordings and other procedures. We apologize for poor penmanship, misspellings, and occasional Russian. We hope to eventually type it all up. In the mean while, we will do our best to decipher the writing if necessary. There are more notes on experiments with this cat, please inquire with Dr. Beloozerova if needed. 2) Gaze behaviors during locomotion on flat surface in the darkness and light, along ladder with crosspieces 5 cm wide and a pathway cluttered with many small objects. Published. 3) Head movement during walking on the flat surface in the darkness and light. Published. 4) Activity of motor cortex while walking with straddling a long obstacle. Published. 5) Activity of motor cortex while walking along a 5 cm narrow strip. Published. 6) Activity of somatosensory cortex during walking on the flat surface and the ladder with crosspieces 5 cm wide. Published. 7) Activity of neurons in the motor compartment of the reticular nucleus of the thalamus (RE) during walking on the flat surface and the ladder with crosspieces 5 cm wide. Published-1, Published-2. Activity of motor cortex during walking along 5 cm narrow strip and while straddling a long obstacle. Lab notes. 1) Gaze behaviors during locomotion on flat surface in the darkness and light, along ladder with crosspieces 5 cm wide and a pathway cluttered with many small objects. Published. 2) Head movement during walking on the flat surface in the darkness and light. Published. 3) Activity of motor cortex during walking on the flat surface in the darkness and light. Published. 4) Comparative study of the activity of pyramidal tract projecting neurons (PTNs) of the motor cortex with fast and slow conducting axons; walking on the flat surface and ladder with crosspieces 5 cm wide. Published. 5) Activity of neurons in the ventrolateral nucleus of the thalamus (VL) during walking on the flat surface and the ladder with crosspieces 5 cm wide. Published. 3) Activity of somatosensory cortex during walking on the flat surface and the ladder with crosspieces 5 cm wide. Published. No histology was made. The cat was fully rehabilitated and adopted out. 1) Strategies for small obstacle avoidance during walking. Published: J. Neurophysiol., 118(2): 817-831 2017. 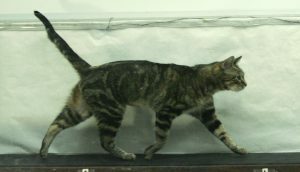 Chu MI, Seto SH, Beloozerova IN, Marlinski V. Strategies for obstacle avoidance during walking in the cat. J. Neurophysiol., 118(2): 817-831, 2017.